The runway at Bristol Airport has been closed, leaving flights on Sunday evening and Monday morning either cancelled or diverted. The airport says the closure from 1430 GMT will allow it to fast-track work on the runway's temporary surface. Ten airlines had cancelled or diverted flights after claims aircraft had skidded on landing in wet conditions. A total of 385 flights and 25,000 passengers have been affected since the dispute erupted on Friday. The airport is improving drainage on the new runway surface and a spokesman said "in a best case scenario" the runway would reopen at lunchtime on Monday. In a statement, Bristol Airport said: "Detailed assessment has been made on Sunday morning on the impact of additional grooving on test strips of the temporary surface, which were put in place during the resurfacing work over the last two nights. "These have proved satisfactory in terms of further increasing the drainage of surface water on the temporary sections of the runway which is in the process of being resurfaced." The airport added the CAA has confirmed they have no objection to the proposed additional grooving work to be undertaken on the temporary sections of the runway. "We are confident that for those airlines which have suspended their operations at Bristol International Airport, this will address their concerns and allow them to resume operations at the airport." Problems began on Friday after Easyjet raised concerns over the safety of the new £17m resurfaced runway. 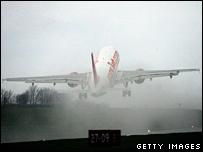 They withdrew services amid fears planes were skidding when landing in wet weather, affecting braking distances. The runway had been undergoing a resurfacing programme which started in October. When runways are re-surfaced airlines often impose their own restrictions on their landing and take-off procedures. These allow for continuing safe operation at airports while sections of the runway are re-surfaced. Each airline may have different operating standards. On Saturday, 98 flights from Easyjet, BA Connect, XL, Thomsonfly, Thomas Cook, Balkan Airlines, First Choice, Air Malta, KLM and SN Brussels were diverted and 28 were cancelled. Around 7,000 extra passengers were diverted to Cardiff Airport on Saturday while other flights departed from Birmingham. Astreus, Aer Arran, Ryanair, Air South West, Aurigny, Continental and Flybe carried on using the airport. Peter O'Donovan, from Aurigny, said the airline was still flying as they use smaller aircraft which do not need such a long landing strip. Bristol International Airport Managing Director, Andrew Skipp said: "Safety is always our top priority. "At all times the CAA have confirmed that our runway is safe, and the process we have been following for the re-surfacing, which is still underway, is correct. "I can only apologise to travellers for the disruption this is causing to their journeys, and reassure them that we are working hard to rectify the situation as quickly as possible." Airlines have welcomed the runway closure. A spokeswoman for XL Airways said: "This is good news and we are looking forward to getting back into Bristol as soon as the modifications are made because we want people flying from their local airport." Easyjet, which cancelled or diverted all its flights on Sunday, has cancelled 40% of Monday's flights at Bristol with the remainder diverted to use Cardiff. Passengers are advised they must still check in at Bristol Airport where they will then be transferred to Cardiff. 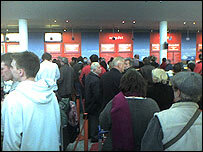 It is not possible for passengers to check-in at Cardiff International Airport as Easyjet do not have any check-in facilities at this airport. Other passengers have been advised to contact their travel agent or airlines direct for an update, or check the Bristol International Airport website.